The first time I drove a Prius I felt a bit special. I don’t mean in the same way as when I first drove a Ferrari Le Ferrari, or even a humble Toyota 86, because that would be silly. I mean the fact that I could sit at a set of traffic lights in silence then move off also in silence. I could lurk in a dark underground carpark in silence, and at traffic lights, only the soft sounds of Beethoven disturbed the day’s gentle deliberations. Now, the damned things are everywhere. The unbiquitous whine can be heard in taxis country-wide and therein lies my problem. 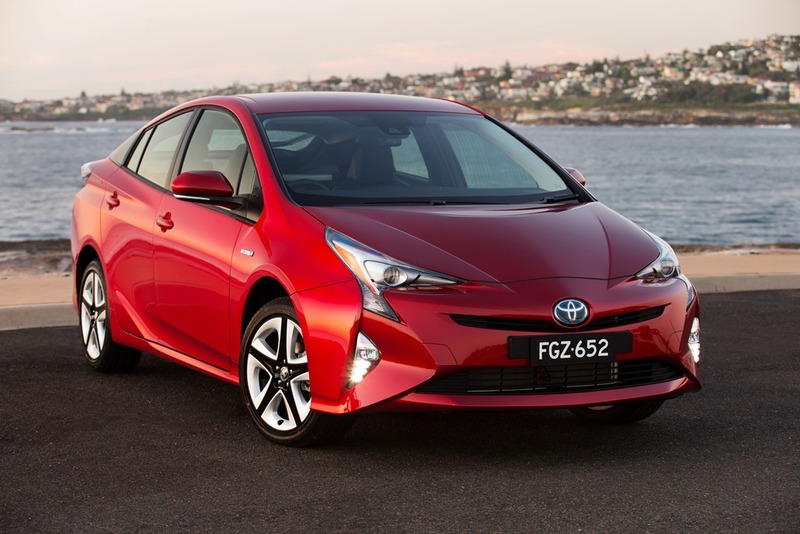 Of course there are a few Prius taxis on Australian roads, but by far the majority appear to be Camry Hybrids. And there you have it, even taxi drivers know the Camry is a better prospect for everyday use. It is bigger and cheaper. Then Toyota brought out the new Prius. 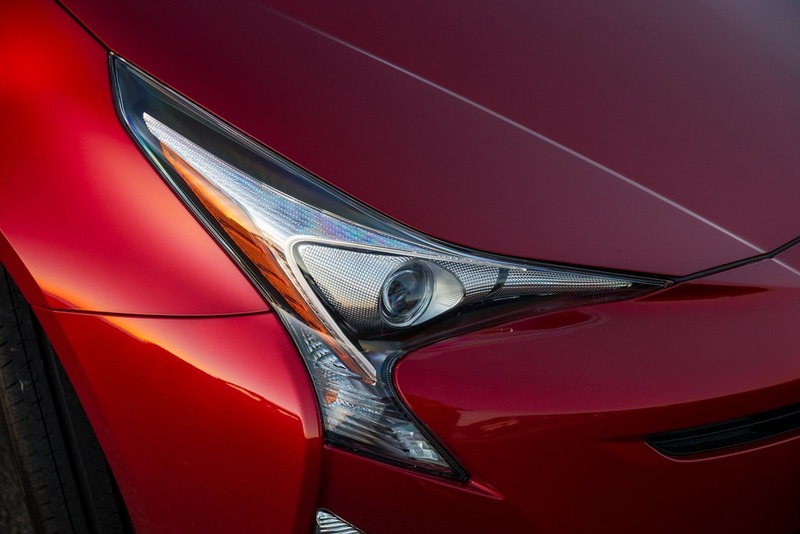 Toyota says the new Prius has double wishbones which makes it a better drive, but better than what? The previous model was a bit on the dull side as far as drives go. It is designed for efficient city fuel consumption, but more than that, it’s designed to make a statement about what a driver. It says “I’m green, grrrrrrrr,” as if anyone cares. Toyota should stop campaigning as if the Prius is a driver’s car. Drivers know it isn’t, but that isn’t its strength. Let’s deal with the looks first. Toyota took the slightly awkward looks of the previous generation and made them look slightly more awkward by putting lines and heavy sculpting all over the place just for the sake of it. 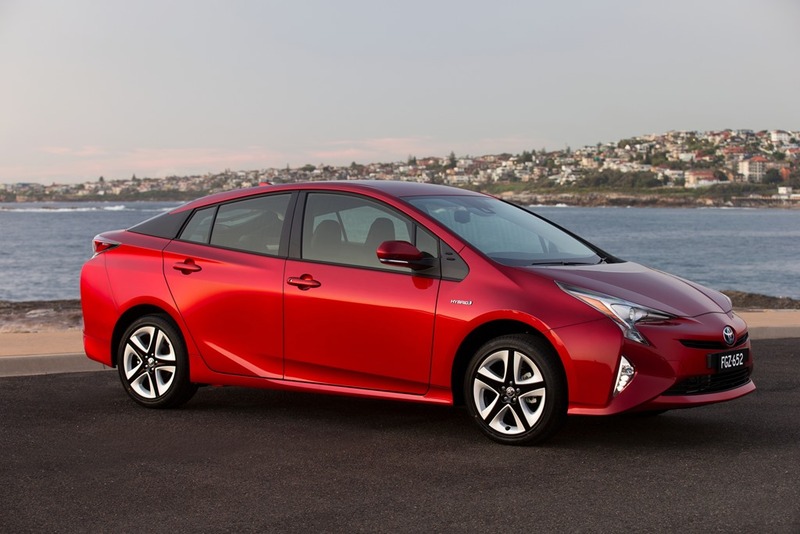 Since Prius was no great beauty to begin with, the new one isn’t any better or worse, just more cluttered. In trying to consolidate its point of difference with other vehicles, they’ve gone for a polarising style which people will either dislike, or tolerate, but few will actually like. They say Prius has one of the lowest drag coefficients around, and at .24 they’re probably right. This measures how easily the air slips over the bodywork. It is also partly responsible for the styling. In my opinion, drag coefficients should be slapped if this is the result. The interior is pleasant, and the centre-mounted driver info module will either please, or not. There are slight retro flashes of white contrasting the black dash materials. 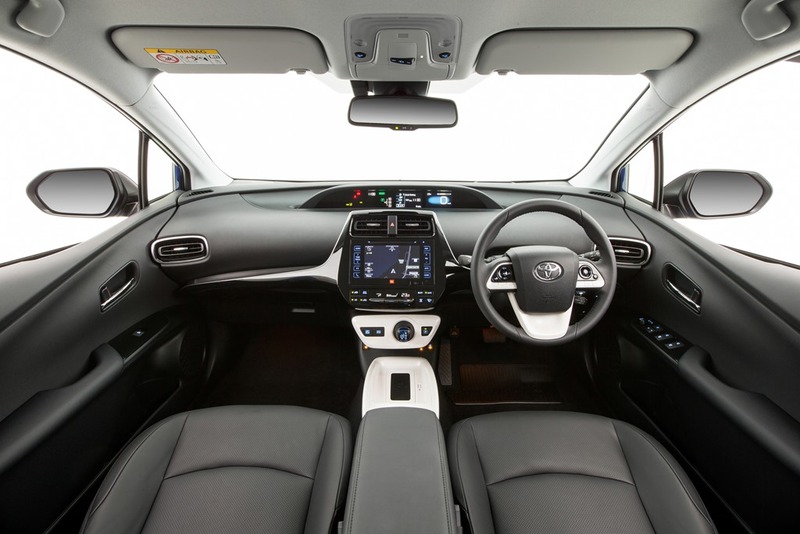 The leather and plastics feel good quality, and they are put together with Toyotas usual obsessive eye for . There is piano black, with the shiny white bringing a certain 50’s feel to the Blake’s 7 cabin. 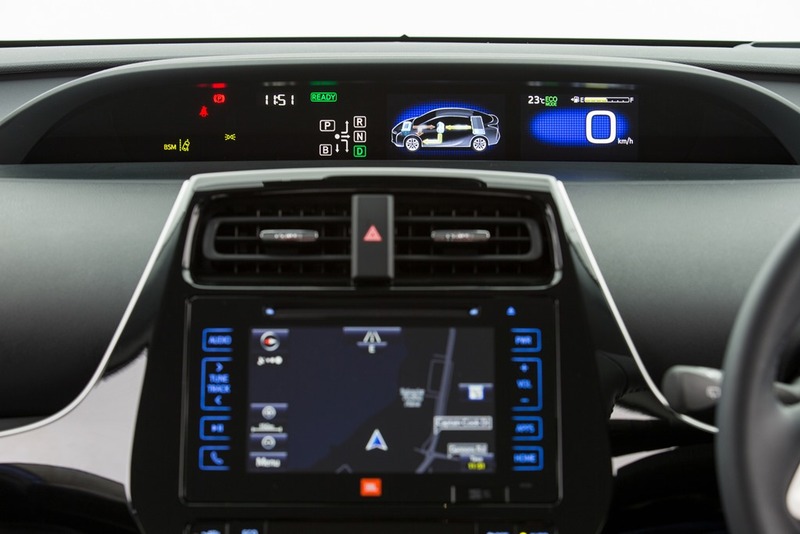 The standard Toyota infotainment screen is a tablet-style affair with fixed buttons down either side. Its easy to use but has a few little foibles. I had the same problem finding some of the DAB stations that I always do with this system. There is a faff to find everything but once the stations are tuned to your presets, you leave the station/preset set to Preset. Then you can use the steering wheel buttons to scroll back and forth. There is neat a pad to wirelessly charge your compatible phone. Bluetooth and USB are also present. I’m pleased to report pairing your phone is both quick and easy by pressing the Phone button while your phone is in search mode. A single confirmation is all you need to be connected in about 30 seconds all up. There is no Apple Carplay/Android Auto. Damn and drat! A company like Toyota should be all over it. Shame on them. The climate controls for the 1 zone system are just below the tablet. Under that is the gear shifter. 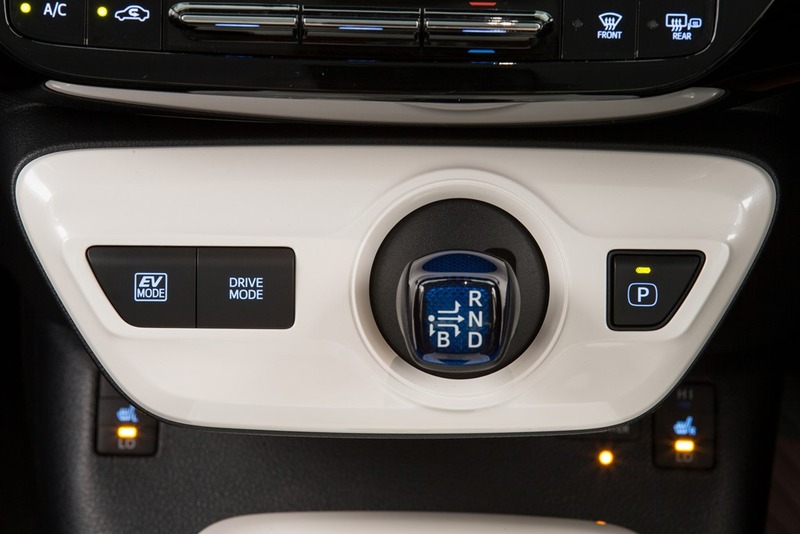 Instead of a conventional selctor, the gear lever goes up and down to select forward and backwards. 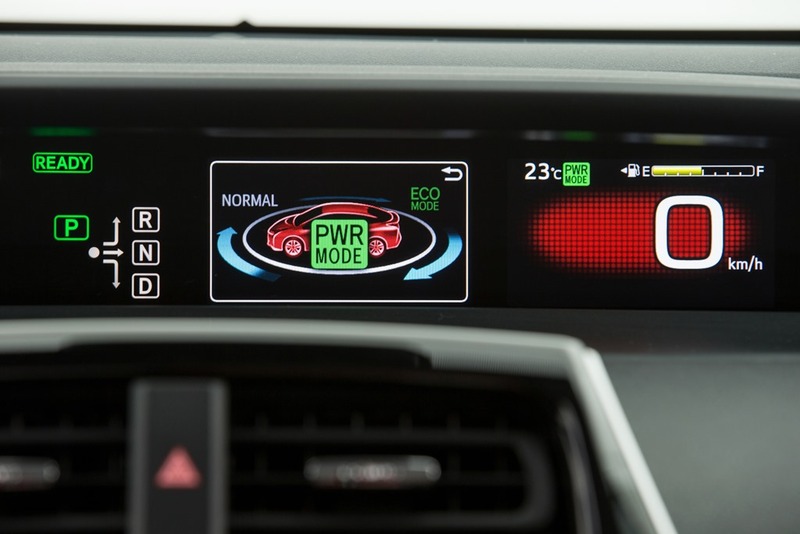 Once “D” is selected, you’re then able to move the lever to the left then down to go into “regenerative braking” mode. This faffing around is ridiculous and is hard to use. You find yourself not being able to go into reverse, or selecting B instead. 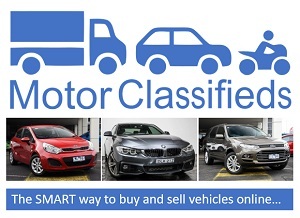 If you try selecting B while on the move, you could find yourself in neutral. To add to this misery, the radar cruise control won’t operate in B mode. You do get a flash in the dash but if you miss it you’ll fiddle trying to get the cruise to work. The Park button is on the right, so why can’t a B button be on the left? Regenerative braking should disengage when Cruise is selected. The current setup is daft and incredibly annoying. Also designed by the devil, the foot operated parking brake is on the extreme left of the footwell. This should be electric and could easily be set next to the phone charging pad. After all, you’re hardly likely to ever want to do a handbrake turn are you? Well, not in a Prius anyway, so an electric brake is no disadvantage. 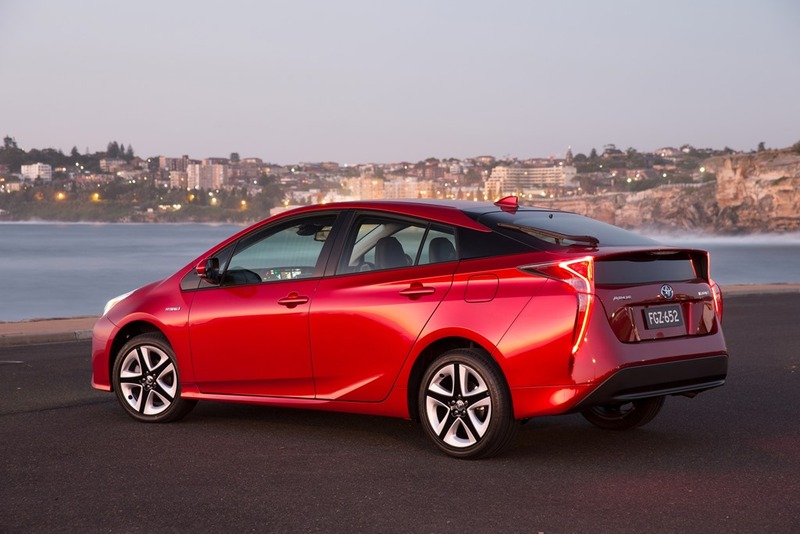 The standard Prius is fitted with 15-inch alloy wheels with stylish new aerodynamic covers to promote fuel efficiency. 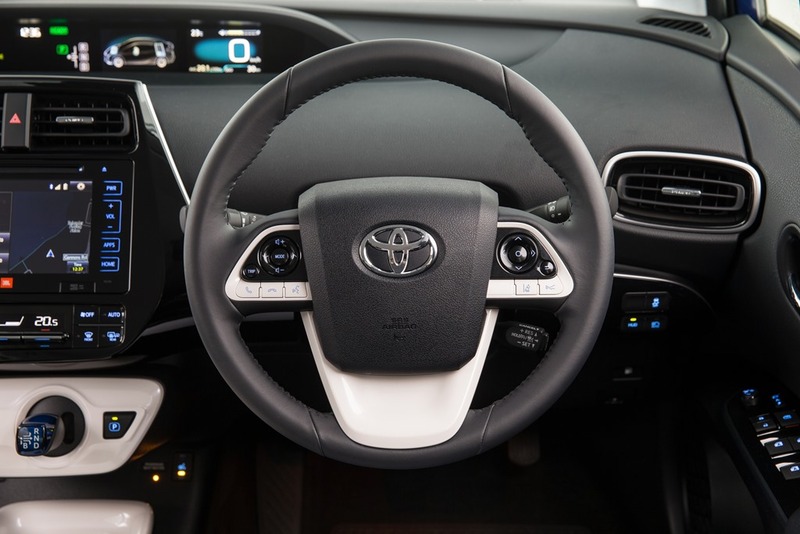 In addition to the four new safety technologies and colour head-up display, it also gains auto-levelling bi-LED headlamps, LED daytime running lamps, 10-speaker JBL audio system, Toyota Link# connected mobility, three-spoke leather-accented steering wheel, premium door trim and a wireless phone charger##. These added features more than account for a $2,500 price increase to $34,990^. Satnav should be a standard feature across the range because this once costly option is now as cheap as chips. One feature I love is auto high beam. Once you’re used to it you will never accidently blind another unsuspecting driver again. Once activated, the system senses street lights, brake lights, and head lights and dips to low beam sooner than a driver will. It takes no time at all to come to trust it, and unlike a driver, will not forget after long periods in the saddle. I dislike centre mounted speedos, but clever old Toyota stuck a heads-up display in right in front of the driver. It projects onto the windscreen with all the important info on it. With the speed and Satnav directions on the windscreen, the driver never needs to look down unless he wants to. The hybrid setup is the next generation of the Synergy system. The 73kw/142Nm euro 5 petrol and a 53kw/163Nm gives acceptable performance, and the batteries are also lighter and more efficient. Prius weighs a heavy-ish 1,400kg, which is for a car this size is fairly hefty. All electric vehicles suffer from heavy-battery-syndrome, but the electric motors are now slightly lighter which adds to an overall weight saving. 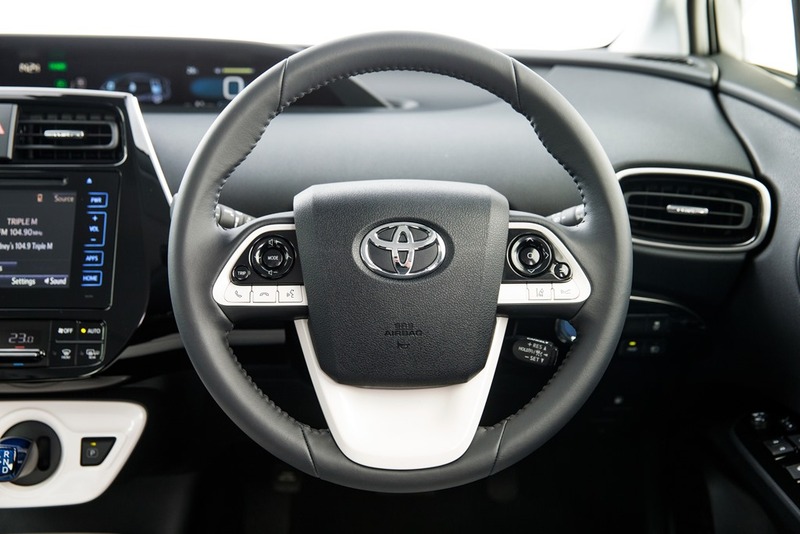 Toyota claims the double wishbones and well calibrated electric steering result in excellent handling, but it doesn’t. The ride is ok over flat road surfaces, but clunks along on uneven roads. There is noticeable oversteer on brisk cornering. Prius is not a sports car. Toyota claims 3.4L/100k but our fuel usage was no better than 5.8L/100k. While 5.8 is very good, it is nowhere near the claimed figure. 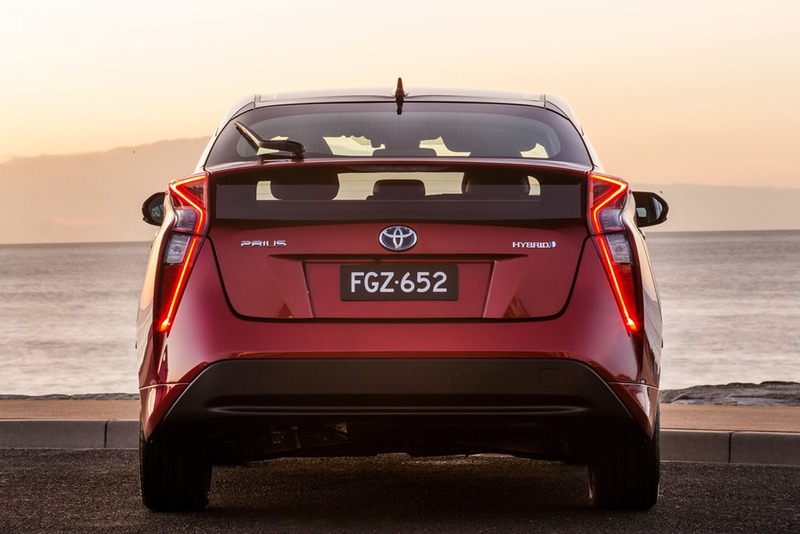 Prius has a 43L fuel tank so on our figures a long trip would drive you nuts. I’m not in love with the looks, but the cabin is comfortable with a retro/modern feel. 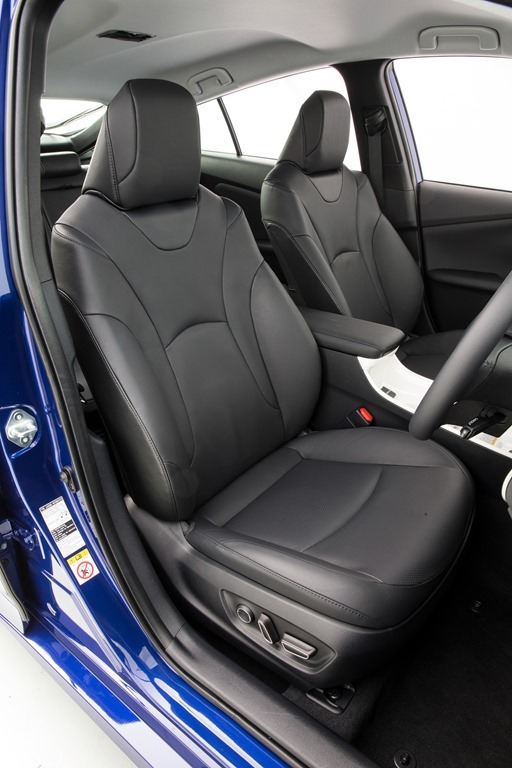 The seating is very comfortable with electric adjustment in the top model. What Prius does, it does well. Around town it delivers comfort and reasonable economy. As I pointed out earlier, Camry is bigger and slightly cheaper, but now you can get Corolla Hybrid for 30 grand. I have trouble seeing where Prius fits in the range. Its position has been usurped by Camry and Corolla, both of which look considerably better. Would I buy one? No, I’d buy Camry or Corolla if I had to buy a Toyota hybrid. The new C-HR is coming next year and looks like a cracker. Next to the stunning C-HR, poor Prius looks like grandma with a facelift.